Children like Rafi are suffering from severe malnutrition in Yemen. Help us by sharing our letter. As violence in Yemen nears its fourth year, the country is facing the world’s worst humanitarian crisis in decades. More than 14 million people are facing starvation and an estimated 85,000 children may have died from extreme hunger since the start of the conflict. 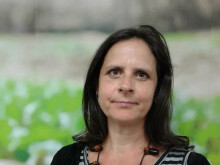 Our country director in Yemen, Valentina Ferrante, recently told the UK media about mothers who are forced to choose between which child to feed and which child starves. Other charities report that older people are being forced to sell their homes and possessions just to survive another day, while many parents have no choice but to give their children contaminated food and water. No-one should be forced to make such impossible choices, but this is the brutal reality for families in Yemen right now. People are hungry, scared and desperate. That is why Action Against Hunger, along with the other INGOs have decided we must reach out together with one voice to our supporters, to the British public and to our politicians, and ask everyone in the UK not to look away, but to stand by the people of Yemen living through this nightmare. While mothers, fathers and grandparents in Yemen are facing life or death choices every day, here in the UK we can make the choice to support those facing catastrophe. Please join Action Against Hunger and add your voice to our urgent plea to the UK public, UK Government and parties to the conflict not to forget the people of Yemen on the brink of starvation. Charities like us are reaching hundreds of thousands of people with lifelines in this urgent, life-threatening humanitarian emergency, but hundreds of thousands more people need our help before it is too late. There is some hope, with a ceasefire in the vital port of Hodeida largely holding and flows of vital food and medicine imports opening up, but most Yemeni people do not feel this hope as they continue to teeter on the brink of famine. Please give the people of Yemen some hope. Share our joint letter to the UK public and Government on social media on January 28th. And ask your family, friends and colleagues to spread the word too. 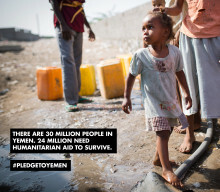 We the undersigned come together at the start of 2019 to remind the international community that Yemen is experiencing the worst humanitarian crisis in the world. More than 14 million people are facing starvation and an estimated 85,000 children have already died from extreme hunger since the war escalated in 2015. Aid workers in Yemen have spoken to parents who say they are forced to give their children contaminated food and water, or nothing at all. Older people are being forced to sell their homes and belongings, just to survive another day. No-one should be forced to make these impossible choices. There is some hope for the future, with a ceasefire brokered last month in the critical port of Hodeida largely holding and promises to restore vital imports of food and medicine into the country. But sadly, most Yemeni people do not feel this hope. Aid and commercial goods are not yet flowing in at the level needed to address the unfolding crisis. People are hungry, they are scared and they are desperate. Aid workers are reaching hundreds of thousands of people now with lifelines, but we simply must see greater action by all parties to allow us to reach more Yemenis before it is too late. We urge all parties to the conflict to remember that the people of Yemen must come first. We urge the public not to look away, not to forget the Yemeni families on the brink of starvation. The people of Yemen cannot wait. We have been working in Yemen throughout the conflict to provide vital support to malnourished children and their parents. Action Against Hunger works in locations across the entire country where there is especially vulnerable children. In 2018, we worked in 60 health facilities treating acute malnutrition, benefiting almost 31,000 children. We also supported the provision of essential medical treatments, reaching over 530,000 people. 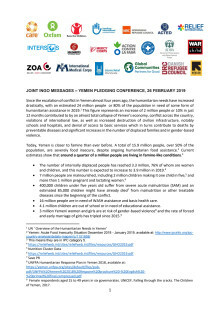 As we approach the 2019 High-Level Pledging Event for Yemen on February 26, humanitarian needs in the country have increased drastically since the escalation of conflict in the country almost four years ago, with an estimated 24 million people or 80% of the population now in need of some form of humanitarian assistance this year. Since the escalation of conflict in Yemen almost four years ago, the humanitarian needs have increased drastically, with an estimated 24 million people or 80 per cent of the population in need of some form of humanitarian assistance in 2019. This figure represents an increase of 2 million people or 10 per cent in just 12 months.